A new urban district of 50,000 people is anticipated between North and Webster Avenues and 90,000 people already live within a half mile of the corridor today. Large-scale, publicly-owned open space is essential for livability at this dense urban scale. 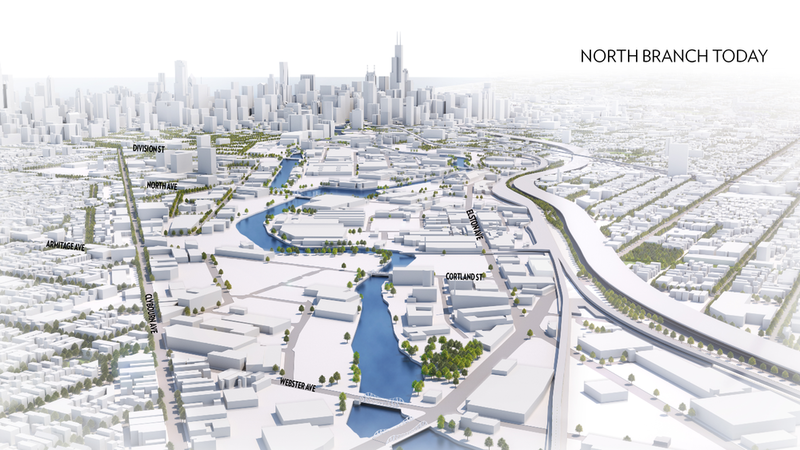 New neighborhoods will emerge where none existed before in former manufacturing districts on both sides of the Chicago River. Public access to the riverfront on city-owned land with connections to existing neighborhoods is essential to the long-term benefit of Chicagoans. This image depicts current conditions within the North Branch Corridor looking south from Webster Avenue towards downtown. This image depicts the allowable density enabled by the North Branch Framework with buildings located along the 30’ river setback. Note: This image does not represent specific development proposals by the City of Chicago or real estate developers. This image demonstrates how contiguous, underutilized brownfield sites could be assembled and transitioned into a 24-acre public amenity that serves all Chicago residents and enhances the ecology of the Chicago River. Note: Development density could be transferred from the park site to adjacent land in order to achieve the City’s overall growth goals.